The fastest lens ever in a Nikon COOLPIX. The COOLPIX P300 camera does justice to your photographic talents with a 4.2x wide angle, F1.8 maximum aperture NIKKOR glass lens. This is the fastest lens Nikon has ever designed into a COOLPIX camera—it offers a 24-100mm optical zoom range and impressive telephoto performance for razor-sharp images. Plus, its maximum aperture of F1.8 assures exceptional low-light results and minimum depth of field. This outstanding lens will showcase your skills whether you’re shooting portraits, panoramas, weddings, real estate, products, publicity stills, or any other challenging compositions—and will do so with still images or Full HD (1080p) movies. Simply put, this high-performance lens catches detailed images while displaying Nikon’s proud tradition of producing precision camera optics. Advanced features for challenging conditions. Its 12.2-megapixel CMOS sensor provides superb image quality, high speed operation, and exceptional low-light performance. The back-illuminated CMOS lets you shoot true-to-life pictures with remarkable detail and colour clarity. The COOLPIX P300’s four-way VR Image Stabilization is also a boon for handheld shooting. Custom optimized for this COOLPIX P300 model, Nikon’s exclusive EXPEED C2 processing engine enhances professional quality images. You’ll also love Motion Detection’s ability to identify moving objects in frame, adjust shutter speed and ISO, and freeze the subject to create stunningly sharp photos. When activated, Best Shot Selector automatically records up to ten shots with a single press of the shutter and then selects and saves only the best image. The camera’s high ISO speed of up to 3200 with advanced noise reduction assures brilliant still images of dimly lit and fast moving photo subjects. Manual control for the serious photographer. The COOLPIX P300 allows photographers to stretch their creative limits with an impressive range of manual control. There’s a Mode Dial for quick and convenient control over select settings, including shutter/aperture/programmed and manual exposure. Exposure Bracketing automatically brackets exposure for three shots. And the ISO can be set as high as 3200 at full resolution to control image quality in low-light conditions or when shooting fast moving subjects. The COOLPIX P300 also features several new in-camera special effects, including High-Contrast Monochrome for sophisticated black and white shots. Nostalgic Sepia adds character and mood or creates shots with an antiqued look. In-camera editing functions such as Quick Retouch, and active D-Lighting restore detail and contrast. This camera comes with several filter effects like Painting, Fisheye, Miniature, and Cross Screen. You can also control images with a creative slider that adjusts brightness, intensity and hue. Full HD movie recording at 1080p. HD movies have become the standard for web posting, website design enhancement, publicity clips, and real estate property tours—or simply for capturing action that delivers so much more impact in high quality video. With the COOLPIX P300, you can shoot Full HD (1080p) movies while recording full stereo sound. The One-Touch recording button allows instant moviemaking, while the optical zoom control creates a variety of cinematic effects. You can even shoot still images while recording, or use slow and fast motion HD movie options for 15, 60 and 120 fps (reduced resolution). Viewing and sharing your movies is simple, too, with an HDMI-CEC output that allows in-camera playback or convenient hookup to an HDTV or computer. The COOLPIX P300 takes the guesswork out. Every shooting environment comes with its own unique characteristics, and the COOLPIX P300 has intuitive features to help you master each one. It optimizes settings for up to 20 common scenes so you simply point and shoot. Turn on the Scene Auto Selector and the camera automatically recognizes the scene you’re in and selects the best one from among seven choices. With Nikon’s ingenious Easy Panorama Scene Mode, just pan in any direction and it will automatically detect the movement, then combine and assemble the various shots into one seamless 180 or 360-degree panoramic image. Nikon knows that night and low-light shooting present tricky challenges. Advanced Night Landscape and the related Advanced Night Portrait are invaluable tools that eliminate the guesswork by shooting consecutive shots at fast shutter speed and composing them into sharp depictions of night scenes. Photo ops often arrive without warning, but your COOLPIX P300 is always ready with invaluable features like ultra fast start-up and autofocus—plus automatic High Speed Shooting that can capture up to seven shots in a second at full resolution. You can compose your shot using the large, three-inch LCD clear colour display. This precision, 921,000-dot, ultra-high resolution screen produces rich detail and excellent contrast, and includes anti-glare coating for easy viewing of photos and HD movies. Nikon’s Smart Portrait System offers useful tools that refine every shot. Smile Timer automatically releases the shutter when your subject smiles, while Face-Priority AF detects and focuses up to 12 faces at once. When activated, Blink Warning alerts you when a subject may have blinked and suggests a retake. The innovative in-camera Red-Eye Fix addresses the problem by correcting for red-eye while the camera is shooting. Uneven or ruddy complexions can also be corrected with Skin Softening, which smoothes skin tones at three different levels and can be applied while shooting or during playback. Your close up shots will also be enhanced by the COOLPIX P300’s Macro Shooting capabilities, taking clear, sharp pictures as close as 1.2 inches. 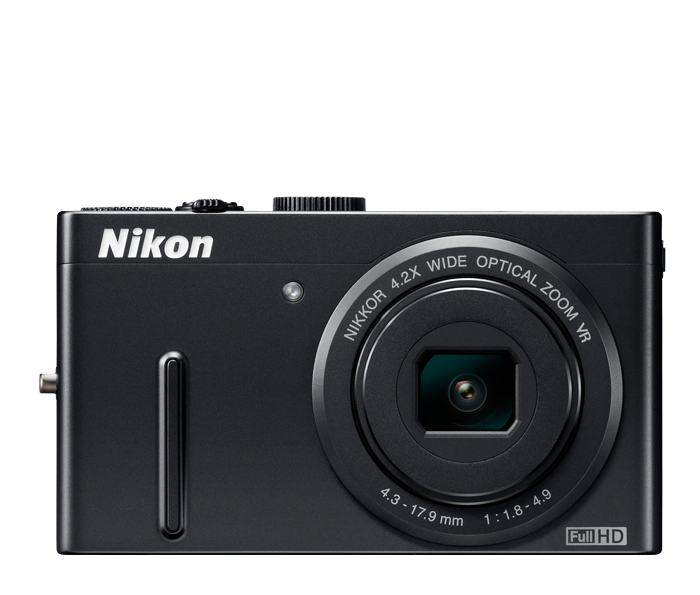 And feel free to click away, as this COOLPIX has a 240-still shot capacity and comes with an EN-EL 12 Li-ion rechargeable battery.